Check out the full collection of videos from NAB 2014, along with our staff picks! In this month's gazette, see our full AES booth schedule; our wrap-up of IBC; new equipment from Shure, Zoom, Cable Techniques, and Tascam; firmware and service updates; and more! Check out May 2013's gazette with an exciting event in Atlanta; a preview of the Inkmasters custom sound system; an interview with David Sonnenschein; NAB 2013 wrap-up, a Bill Daly story, sales specials, and more. Check out the March Gazette! In this month's issue, Roland and Sound Devices events, the new Lectrosonics Dante Breakout Box, the Betso SBOX-1, Mac mini modding, Focal speaker sale, and more! Read more about Check out the March Gazette! Nurse Jackie Seminar, new K-Tek boom poles, a JoeCo update, DSLR audio kits, Rode sales, new rentals inventory, and more! Read more about January Gazette! In this issue: Sennheiser and Tascam specials, Roger Phenix's reflections on filming in the Galpagos, a Sound Devices 664 update, and more! Buy any qualifying Sennheiser G3 wireless microphone system and get your choice of a free ME2 lavalier or HD429 headphone with rebate. Offer applies to the ew 100 ENG, ew 112-p, ew 122-p, and ew 135-p. Some conditions apply. Call or e-mail for details. Offer valid through May 31st, 2012. NAB's acronym turned out to be unfortunately prognosticative this year, as both the Zaxcom and Lectrosonics booths had a large quantity of equipment stolen. The serial numbers are here for Zaxcom and here for Lectrosonics, so please keep an eye out for this gear on the used market. Thanks! 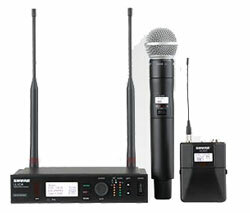 Zaxcom has just introduced the latest generation of their alternative to wireless microphones, the ZFR300. This lightweight, mini timecode-referenced audio recorder is the perfect size to stash on an actor in reality television or any challenging production environment or when there's simply too much interference and it's available right now. Zaxcom has also debuted the TRX742 plug-on transmitter. It includes internal recording and Zaxnet and can be conifgured for use with a whole host of microphones. Neat! See Zaxcom president Glenn Sanders showcase their new devices at NAB 2012. And in this case, fully submerge it! 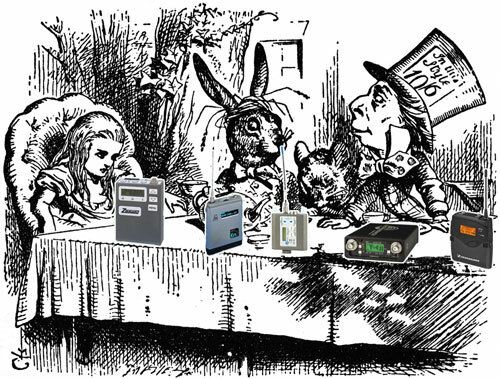 Lectrosonics has just announced their new watertight transmitter, the WM. It's got all the usual fidelity and features of a Lectro transmitter plus remote operation. It's expected to ship second quarter this year. The future of syncing timecode wirelessly marches on, as Timecode Systems Ltd adds the Timecode Buddy to the contenders. Consisting of the Timecode Buddy: master and the Timecode Buddy: tx, with a free iOS app available, it's a simple and reliable way to sync your timecode across set, and it works with gear you already have. This equipment is still pending authorization from the FCC and may not be sold until it is granted. See company founder Paul Scurrell talking about the system at NAB 2012. We're sad to note the passing of Frank Haber at the age of 72 on March 19, 2012. He had an illustrious 30 year career sound engineering and mixing for motion pictures. Frank fixed my first Nagra and was incredibly generous with his time and advice and I'll always be grateful for the help he gave to me as a young mixer. Our condolences to his friends and family. The Hatter was the first to break the silence. 'What block are we using?' he said, turning to Alice: he had taken his spectrum analyzer out of his pocket, and was looking at it uneasily, shaking it every now and then, and holding it to his ear. 'Two gigahertz wrong!' sighed the Hatter. 'I told you butter wouldn't suit the works!' he added, looking angrily at the March Hare. So, we may have gone a little mad down here, but it's all to your advantage, because we've got two totally less than sane offers for you! of ANY new wireless system(s)! Offer valid only while supplies last, so hurry! Call or e-mail us today to become a lean, mean, spectrum-scanning, FCC licensed machine! Is your RF Explorer feeling lonely? Cheer it up with a utility-expanding RF Explorer Accessory Kit! A mere $170 brightens your spectrum analyzer's outlook with better performance and increased protection against damaging frequencies! Brother, if there's a better package deal for happiness, I sure don't know about it. First off, there's the brand new ULX-D Wireless System, ideal for schools, houses of worship, and other live performance venues that require a robust, cost-effective solution. It consists of the ULXD4 Digital Wireless Receiver, ULXD2 Handheld Wireless Transmitter, and the ULXD1 Wireless Bodypack Transmitter. The VP89 is a shotgun condenser microphone. It's designed with interchangeable long, medium, and short capsules for a solution that scales to your needs. And last, but not least, the SRH440 Professional Studio Headphones, are a good alternative to the venerable Sony 7506's, which are in short supply at the moment. Looking to replace your Fostex DV824 for telecine? Look no further than the new Tascam HS-8 Recorder for the latest in playback and recording to solid state media. And don't forget the HS-P82 which records to 2 CompactFlash cards and has the ever-nifty RC-F82 control surface available. Matt Robertson, R.I.P Matt Robertson, Lectrosonics' West Coast representative, passed away suddenly March 9, 2012. Our condolences to his friends and family. Emmy Nommy Congratulations to friend of Gotham, 24/7, which garnered a staggering 8 nominations for Sports Emmys this year, including one for outstanding post-produced audio for Flyers?Rangers: Road to the NHL Winter Classic! Good luck to them and all the nominees. Thanks to speaker Henry Cohen and everyone who attended our recent seminar on TVBDs: Understanding How They'll Operate and How to Best Avoid Interference. We'll be posting the video soon, so keep watching this space.